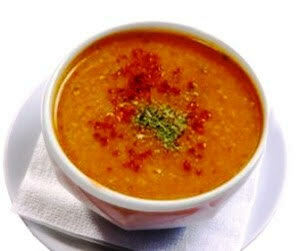 TheArmenianKitchen.com : Christine Datian's 'Armenian Tomato and Bulgur Soup' is sure to please! Christine Datian's 'Armenian Tomato and Bulgur Soup' is sure to please! Chris notes that this recipe is great for vegetarians and/or Lent by using vegetable broth or water as the base in place of chicken broth. Thanks, Chris, for sharing your recipe with us! Bring broth (or water) to a full boil over moderate heat in a large pot. Meanwhile, in a small pan, sauté the onions and bell pepper in olive oil for 5-8 minutes until the onions are golden brown. Set aside. Add the tomato paste to the boiling broth. Stir until tomato paste is distributed evenly before adding the bulgur, salt, and pepper. Stir to combine, then add the cooked onions and bell pepper. Cover pot, lower heat, and simmer for 15-20 minutes, stirring a few times before serving. Serve hot soup with a little lemon juice, and top with paprika or Aleppo pepper; garnish with chopped tomatoes, parsley and mint. Drizzle with olive oil, if desired.